Digital & Lithographic Printing, plus full Graphic Design services. 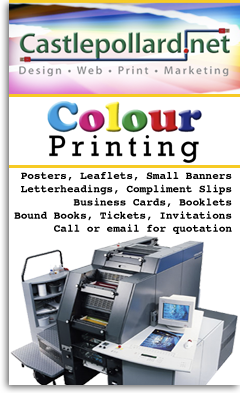 Ideal for Posters, Leaflets, Invitations, Booklets, Programmes, Stationery and much more, just phone for a free quotation. Green Street Pharmacy is an independently owned & run pharmacy. Our goal is to provide the most professional service whilst still offering value for money customers have come to expect. Unit 5, Castlepollard Enterprise Centre, Water Street, Castlepollard. We are a wholesale and retail suppliers of Health & Safety Products, Toiletries & Hygiene Products, Catering Products and Packaging Supplies. Your friendly local pharmacy serving all your healthcare requirements. Our services include collection of prescriptions from doctors, Passport photos and gift items including a wide range of cosmetics in store. UNIT 8, Castlepollard Shopping Centre, Castlepollard. 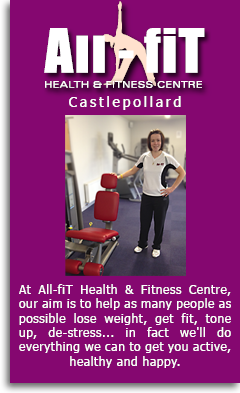 At All-fiT Health & Fitness Centre Castlepollard, our aim is to help as many people as possible lose weight, get fit, tone up, de-stress... in fact we'll do everything we can to get you active, healthy and happy.